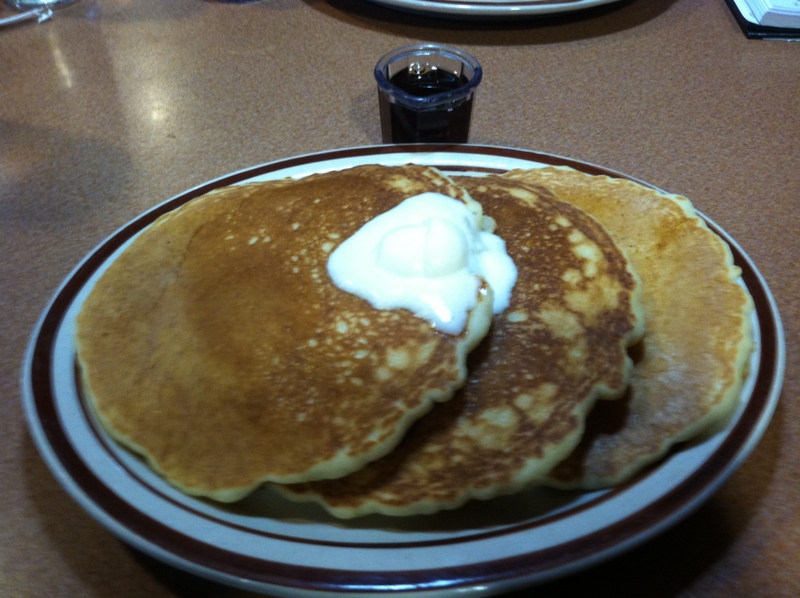 September 13, 2012 – 4:25 P.M.
What’s better for a little afternoon snack than some four o’clock Denny’s? Denny’s is a chain restaurant with numerous locations nationwide. We visited the location at 10480 Metcalf Avenue in Overland Park, KS. Most locations are 24 hour diners (including the location we visited). Their menu is available on their website. They also have Facebook and Twitter. 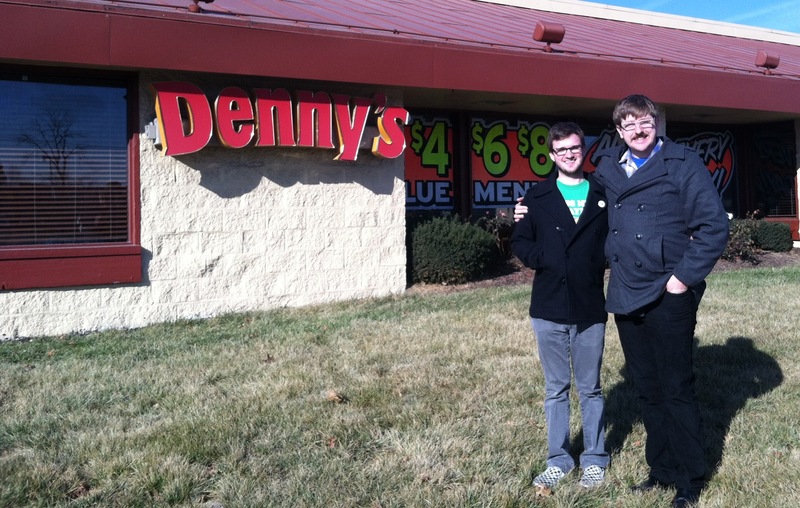 Location/Environment: You can find Denny’s in most major cities. This particular Denny’s is located off the busiest street in OP, Metcalf. Neither of us had been to this particular location since high school, so it was a nice(?) return. It has been renovated since our last visit. It’s as upscale as a true diner can be. It’s a Denny’s. The music is perfect for the baby boom generation looking for a cozy place to eat. Lots of 70’s disco/rock. Not a detriment, just worth noting. 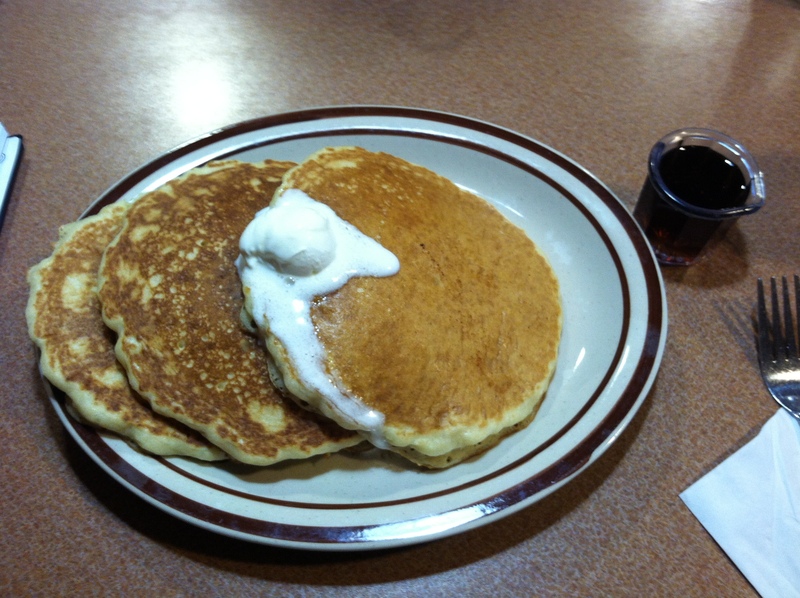 Denny’s might be best enjoyed in the early hours of the morning after a night of drinking and swooning. Service: Our initial server was very friendly, however we didn’t see enough of him. We were helped by three different waiters during our meal, which can be fine, but no connection was made to a single one. It was not particularly busy during our visit, so we got enough service and attention, yet it wasn’t exceptional. Both of us ordered the “All You Can Eat” pancakes. Jared did ask for another round, which he never received, yet was listed on the bill. Denny’s has a unique pay system. It is not a standard pay up front restaurant. When they give you the receipt you are required to fill out the tip/total section before you go to the cashier. This seems to put more pressure on tipping then other restaurants. On the bright side, this is the fastest we’ve received any order on our Panclog quest. Menu/Selection: The menu featured everything you’d expect on a Denny’s (or diner for that matter) menu. Anything from brunch to a greasy dinner entrée to a mouth-watering dessert (such as the maple bacon milkshake). If you’re familiar with Denny’s, you know the menu. They do offer some particularly good deals on their $2-$4-$6-$8 menu. It’s best to go during their baconpalooza or cheesotopia. The rainbow of pancakes is a very broad spectrum. They’re little. They’re big. They’re thin. They’re thick. These particular cakes were your standard run-of-the-mill pancakes. Shocker! About what you’d expect at a Denny’s. They were completely adequate. They were very dense; thick and heavy from the lips to the stomach. I tend to run into the same problem whenever I order “All You Can Eat” anything: I get full on the first serving. That is exactly what happened. Amidst my sea of pancake fatigue and syrup filled veins, I was full after three thick cakes. The cup of syrup was plenty for my meal, however it did make me realize I am quite a fan of a restaurant giving you the carafe of syrup. It’s a subtle yet clear message of “Hey, don’t be afraid to go all out on the syrup. We’re not stingy!” Anyways, the pancakes were fine. ALL YOU CAN EAT PANCAKES! A challenge I will always accept. Denny’s truly makes it a deal with a price tag of only $4. These pancakes were nothing special. Their sole purpose was to keep you living. These pancakes are just fine to average breakfast-teers. These pancakes were way too heavy for my palate. I could not get to my normal AYCE pancake quota of 8 with this heaviness of pancake. I was feeling the great amount of starch in my system before even finishing my pancakes. I would have liked my pancakes in stack rather than a fan. The stack-method is more conducive to my eating habits. The butter was just fine. When butter is partially melted, it is much easier to spread. I wanted to think that the heaviness of the pancakes was a fluke so I ordered another few pancakes because I thought I deserved more. Round 2 never arrived. I was bummed. I would’ve asked about the well-being of my pancakes but I had to get to my night class. So Rest In Peace my 2nd round of pancakes, wherever you are. Price: Four dollars is very hard to beat for all you can eat pancakes. Easily, the cheapest endeavor for all you can eat cakes. If you’re not concerned about top-notch flapjacks and just pure quantity, this is probably your deal. Overall: This is a chain restaurant without a niche in the breakfast market. They’re not looking to press the envelope in breakfast terms, just work the diner formula. And they do it fine.